We have been waiting for this moment a long time - it was teased in the minister's keynote at the 2016 Canadian Science Policy Conference, and now it's official! 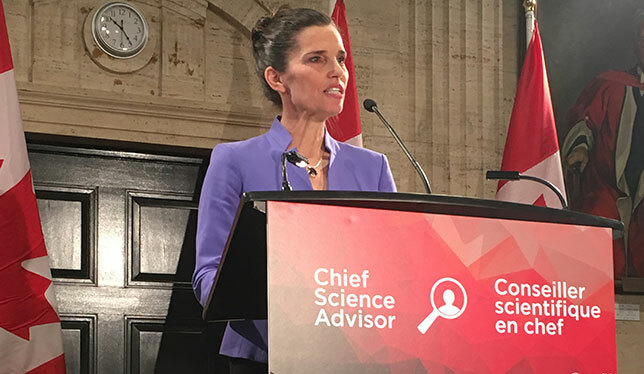 The Government of Canada has launched its search for our new Chief Science Advisor! We have great expectations from our next Chief Science Advisor (CSA), and it is our hope that he or she will serve as a reliable and constant information source for our government. As an agent of change and advocate of evidence-based decision-making, they must master the art of communicating the implications - the "why should you care?" - of important policy issues and new scientific evidence to policymakers, politicians, and the public alike. Canadians care about and want to be implicated in science, now more than ever; the over 1500 submissions received by the Fundamental Science Review Board are just one example of this. Let's make sure this is done right - to best inform the creation of their new mandate, the Advisor should first meet with our provincial Chief Scientists as well as other Science Advisors abroad. From our own interactions with Rémi Quirion (Québec), Sir Peter Gluckman (New Zealand), and others, we know they are very excited to take part in these discussions. We hope the CSA also takes some time to meet with Canadian advocacy and special interest groups, including Let's Talk Science, Evidence for Democracy, the CSPC, and Science & Policy Exchange. We have lots to say and, after all, we're all in this together. We have every confidence that Minister Duncan and her team will select the right candidate. Click here to view the official announcement, and if you think you are a good fit for this important job, submit your application before January 27, 2017!